Netronics Research and Development, Ltd.
12 x 12 x 5 in. Item is built by donor. he ELF II was originally described in a construction article in Popular Electronics magazine published as a four-part series in 1976-77. 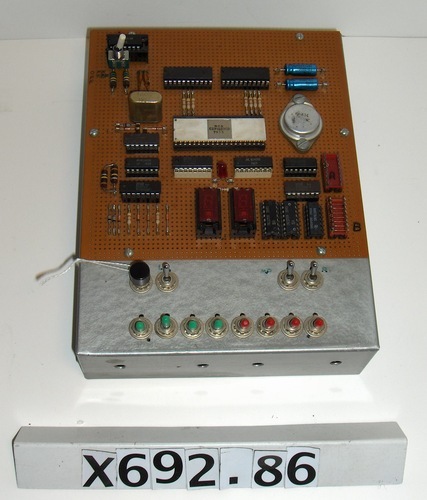 It was based on the RCA 1802 mciroprocessor and offered the first wave of microcomputer enthusiasts an inexpensive means of learning about both hardware and software. 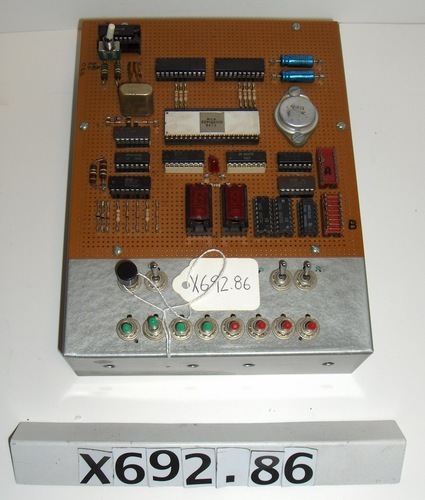 CPU: RCA CDP 1802 COSMAC; Clock frquency: 1 Mhz; RAM: 256 bytes; ROM: none; Input: 8 toggle switches (for data input) Control lines: INPUT (pushbutton) - LOAD (toggle) - MEMORY PROTECT (toggle) - RUN (toggle); Output: 2 hex displays - 1 LED (controlled by output line Q); Power: 5V regulator (on board) - 9V DC 350mA wall supply; Type of construction: point-to-point hardwiring - all IC's socketed; Later additions: input switch for DMA - 8-bit I/O port for remote operation from OSI C1P keyboard. CPU marked: RCA CDP1802CD 7653. Nice photo is A/F.